Andrew Warshaw finds out how the transformation of Tottenham’s stadium is having a far wider impact across the local area both economically and socially. He is an intensely private man who shuns the limelight and is rarely interviewed, his expressionless face giving away few clues about his thoughts and emotions whenever the television cameras zoom in on his seat in the directors’ box. But Tottenham Hotspur’s Daniel Levy, winner of Premier League CEO of the Year sponsored by SeatGeek at the Football Business Awards 2017, prefers to let his actions do the talking. While Levy may in the past have divided opinion, with many fans bemoaning Tottenham’s image as a selling club that can never emulate past glories, times are rapidly changing. Much of that is down to the skills of manager Mauricio Pochettino and his courageous willingness, rare among top-flight coaches, to bring through exciting home-grown talent. But behind the scenes it is Levy, one of the canniest and most savvy operators in the game, who pulls the strings and deserves equal credit – if not more – for Tottenham’s progress over the past couple of seasons and, more long-term, for what promises to be a buoyant future at their eagerly anticipated, state-of-the-art 61,000-seater new stadium following years of under-achievement. Talk to the Tottenham diehards and most of them will tell you there has never been a better time (perhaps apart from the 1960s) to be a Spurs fan, notwithstanding something of a blip at the time of writing that saw the club fall out of the top four. Ah, that phrase, top four. 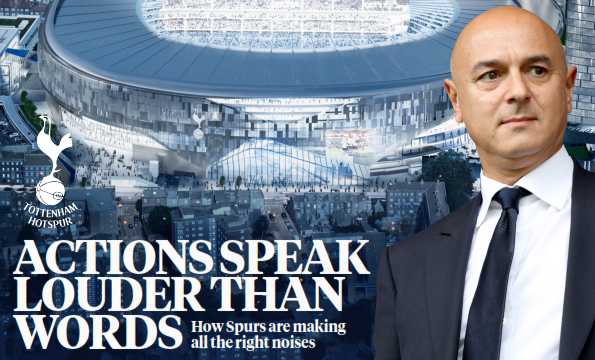 It is a measure of Levy’s commitment to the club he has supported since boyhood that the barrier has been raised in terms of what constitutes success. Tottenham are no longer happy to punch above their weight and occasionally dally with the Champions League. The goal is to do battle with Europe’s elite on a regular basis.